Former Premier League referee Mark Clattenburg has admitted he allowed Tottenham to "self-destruct" when they lost the title to Leicester last year. The official took charge of Spurs' bad-tempered 2-2 draw at Chelsea in May 2016 which allowed the Foxes to clinch a shock top-flight crown. 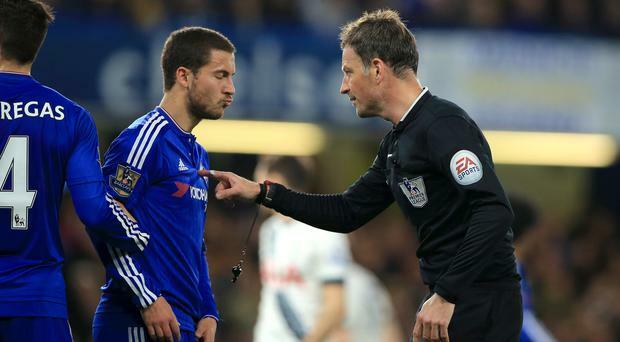 Needing to win to keep their title hopes alive, Tottenham lost a 2-0 lead at Stamford Bridge as Clattenburg booked nine players and Chelsea and Spurs received fines of £375,000 and £225,000 respectively from the Football Association. But the 42-year-old said he went into the game with a plan to avoid negative headlines. Clattenburg told NBC's Men in Blazers podcast: "I allowed them (Spurs) to self-destruct so all the media, all the people in the world went, 'Tottenham lost the title'. "If I sent three players off from Tottenham, what are the headlines? 'Clattenburg cost Tottenham the title'. It was pure theatre that Tottenham self-destructed against Chelsea and Leicester won the title. "I helped the game. I certainly benefited the game by my style of refereeing. "Some referees would have played by the book. Tottenham would have been down to seven or eight players and probably lost and they would've been looking for an excuse. "But I didn't give them an excuse, because my gameplan was: Let them lose the title." Tottenham midfielder Mousa Dembele was retrospectively banned for six games for violent conduct against Chelsea's Diego Costa. Soon afterwards Clattenburg took charge of the FA Cup and Champions League finals as well as the final of Euro 2016. He left his job in the Premier League in February to become Saudi Arabia's head of referees. "The English style of refereeing is different," he added. "I had to referee differently when I went into Europe because none of the top players in Europe would accept some of the physical contact that went on in the Premier League - but that was the theatre, that's what people loved. "They love a tackle, they don't want it punished." Tottenham manager Mauricio Pochettino has refused to rule out the possibility of Harry Kane playing again this season. The future of Marcus Rashford at Manchester United has been called into question, with the Daily Mirror reporting talks have stalled between the striker and the club over a new contract. The paper reports Rashford, who has scored 10 times this season, is demanding wages of £200,000 a week. Tottenham dashed Manchester City’s quadruple dream on a dramatic Champions League night at the Etihad Stadium – thanks to VAR.